Merely by chance the town of Ross-on-Wye was mentioned and the directors decided to take a look at the area. The town had seen a boom of employment during the war years when many factories were evacuated from the large cities to smaller towns where there was less chance of being destroyed by bombing. However, when the war had finished, these companies soon moved back to the cities and Ross people were having to travel to Hereford, Gloucester, Mitcheldean and Lydbrook to seek employment and Ross had some of the highest unemployment figures in the country. It was for this reason that Ross Urban Council had bought and set aside 24 acres of derelict land at Camp Meadow, on the southern outskirts of the town, for industrial development. The site had been used extensively during the war as both a training area for British and American troops and as a prisoner-of-war camp. Two firms had already moved to the site. They were Haigh Engineering, who were a local firm, and Wolf Tools, who were a German based concern. The Company decided that this was a good site for their expansion because there would be good road links and a railway line ran within a few yards of the site. This would have provided an ideal form of transport for incoming raw materials and outgoing finished products. However, the company's plan of having its own siding were never to materialise and the railway line was closed in 1964 due to non-profitability. Before purchasing the land, they decided to exhibit some of their products in a local shop, W P Watsons. Public reaction proved favourable and the Company bought the remaining 14 acres of land and building was soon underway, much of the work being done by the company's own employees. Work proceeded rapidly and soon the building was completed. I must thank Mrs L A Hodson who has helped us in our early days, her daily prayers for us have helped as much as anything. These points do much to prove that the directors had strong religious beliefs, Mr Brewster in particular regularly attended Ross Catholic Church. Father O'Connel, the local minister for the Catholic Church, was to become a regular visitor to the factory said mass and asked for God's blessing on the factory before Mr Little threw the switch which saw production commence on the newly installed equipment. One of the major steps in the Company's history had been taken then, a move away from the area where the Company was founded, to a new one. Woodville had a very active social club. This included a number of teams that competed in various championship events. 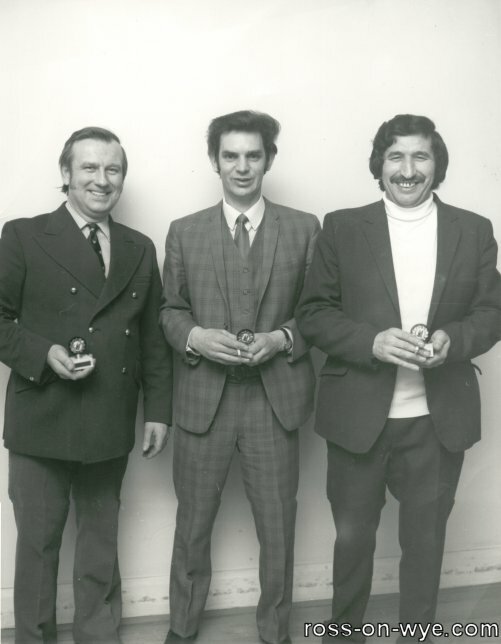 This photo shows the Skittles champions in 1975 and these are (from left to right) D.Eagles, G.Gwilliam and D.Bundy.